Mr Higgledy To The Rescue. An Email: ‘Dear Mr Higgledy, Thank you for such a wonderful and informative blog…you are amazing…and so hunky/handsome to boot. 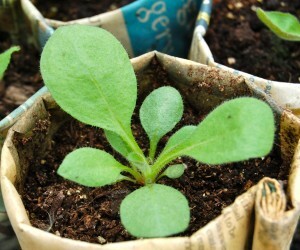 I recently sowed some of your wonderful seeds but am not sure how I will recognise what is a weed and what is a flower…oh do help me please..oh do oh do oh do oh do. Well my dear lady, I shall of course do my best to explain and add some photos. Thank you by the way for your photo…gosh it must have been a hot day when you took that….where are your clothes?! 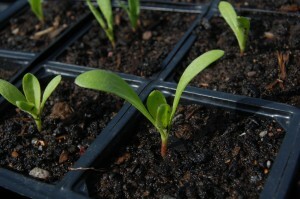 Firstly, if you have followed the Higgledy garden guide to sowing seeds you would have sown in rows. Naturally it will make it easier to detect what is what when they poke up through the ground in a straight line. 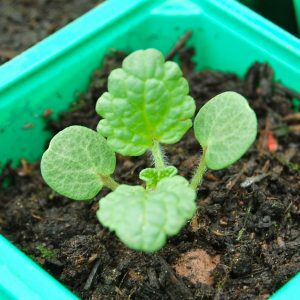 Don’t forget that Bells of Ireland need light to germinate so sow them on the surface of a pre-watered bed. 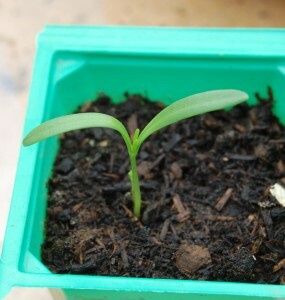 This happy Rudbeckia is sitting comfortably in one of Karen’s paper pots. It looks like a very happy chappie and if you put your ear really really close you can here it whistling tunes from The Wizard of Oz. Give these Cosmos ‘Purity’ a little more space than Calendula, Zinnia and Bells of Ireland…I space mine to about 18 inches and 12 inches for the former. 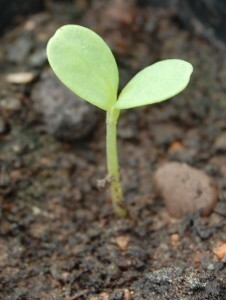 Don’t let the frost touch them…or they will be ex Cosmos seedlings. I doubt whether we will get any more frost here in the provinces. 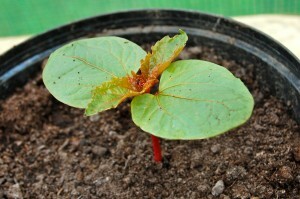 Lastly here is a wonderful Ricinus munchkin…remember that all parts of this plant are poisonous and should not be thrown into Hubby’s rocket salad. I hope this has been of some use to you. Naturally if you get yourself into difficulties I should be delighted to pop over and deal with any issues/desires you may have…on a personal level. How To Dry Cornflowers. Cornflower Taster.